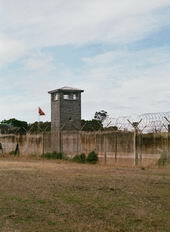 Consider the information about Robben Island Museum in South Africa. Get to know its location and main attractions. Highlight: The former apartheid government's maximum-security political prison, including Nelson Mandela's cell. It is a cold and barren slab surrounded by shark-infested water, seven miles north of Cape Town. Robben Island was "discovered" by Portuguese sailors in 1488 and functioned as a Dutch provisioning station for 150 years. it served as a hospital between 1846 and 1931for lepers, lunatics and the chronically ill. This island is most infamous for its use after 1961 by South Africa's white regime as a maximum-security prison for opponents of apartheid. The most outstanding prisoner was Nelson Mandela who spent about 19 years there and depicted it as "the harshest, most iron-fisted outpost in the South African penal system". The black majority South African government declared Robben Island a national monument and on New Year's Day, 1997, opened it to public. You may see Mandela's tiny cell (now considered a national shrine), the limestone quarries where prisoners worked, and other relics of the brutal apartheid era. There are ferry boats from Cape Town to Robben Island accommodating about 1,000 visitors daily.